There was a time when you needed to have your picture taken in specialized studios whenever you wanted a photo for various personal papers, such as passport or ID. However, now you can do this yourself, without even leaving the house, due to applications such as Print Passport Photo. 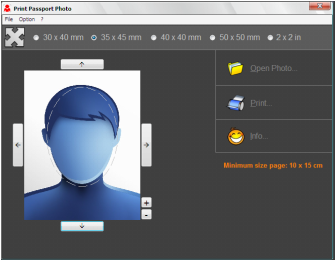 Once you have installed the utility on your computer, you get to access the user-friendly GUI and start working on coming up with a passport photo. You can either drag and drop an image onto the main window of the app or you can browse to its folder using the dedicated button; however, it needs to be mentioned that it only supports JPG images as the source files. Before getting to export the processed pic to the only available format, JPG, you can alter the look of the image as you see fit. More precisely, you can load a large, then move it right, left, up or down, as well as zoom in or out until the face captured in the image is correctly displayed, i.e. it fits inside the frame found within Print Passport Photo. A nifty function of Print Passport Photo is that it comes with several pre-defined sizes that you can turn to, depending on your preferences. Namely, you can create passport photos with the following dimensions: 30x40 mm, 35x45 mm, 40x45 mm, 50x50 mm or 2x2 inches. Once the layout satisfies you, can either export the pic to JPG or you can print it directly from within the app - you can not only print multiple copies, but you can also change the orientation between landscape and portrait. All in all, Print Passport Photo is a simplistic app that actually does what you would expect of it. Although it does not come with a lot of customization options, it is bound to meet the necessities of those looking for a hassle-free utility for creating and printing passport photos.